When you select the Floor, Floor-Defrost or Defrost position, the system automatically turns on the outside (fresh) air position will be selected. 1. Make sure the engine is running or the ignition switch is in the ON position. 3. 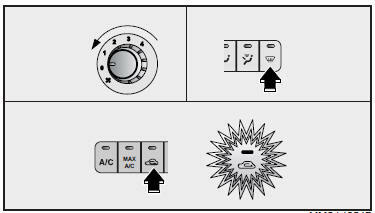 Turn the mode selection knob to the defrost ( ) position. 5. Then the indicator light on the air intake control button ( ) will blink 3 times with 0.5 second intervals between blinks. If you want to return to the automatic outside (fresh) air position, repeat the procedure above.